Seafront_Sperlonga_Apartment - Bellissimo Appartamento Fronte-Mare! Bellissimo appartamento Fronte_Mare - Lungomare di Sperlonga! Splendido e accogliente appartamento, appena ristrutturato, elegantissimo. Può ospitare sino a 4 persone adulte oltre a 2 bambini in piena comodità. Si può godere di un comodo balcone e di una vista mare mozzafiato. Appartamento al primo piano composto da ingresso, salone, cucina a vista, n. 2 camere matrimoniali (in una c'è inoltre a disposizione anche un letto a castello), doppi servizi. Posto auto compreso in parcheggio privato nelle vicinanze. We are a family of five from Norway, two adults and three kids, who stayed at this magnificent place in the center of Sperlonga in June - 2016. The description given prior to our arrival turned out to be correct, both in regards to position of the apartment and the standard/equipment. The apartment is in excellent condition and is well equipped. It is quite spacious for a family of five. The room with a bunk bed and a double bed, was great for our three kids. I would assume that it would be no problem sleeping four persons in this room. The entire apartment was very clean on arrival and we were provided with linen and towels of good quality. The two bathrooms was a joy. Upon arrival we were wondering if there would be any issues with the restaurant on the ground floor. We were glad to experience that there were no noise from downstairs. There were no other issues bothering us from the restaurant. It is an excellent restaurant by the way, worth trying. We found the location of the apartment to be great. It is located at a Piazza at the foot of the old town in a small hill. It's a short walk to the charming old town with restaurants and small shops. The apartment is only a stroll from the beach, which is super. The Piazza is very lively and cozy with it's restaurants and shops. Regarding transport, the bus stops close to the piazza. Finally I wold like to mention the owners of the apartment. They are truly great and very service minded. We got a lovely welcome and an equally great send off. They were at our disposal if needed throughout our stay. We recommend this apartment highly. Thank you for a great time and stay at your place. We would love to come back! 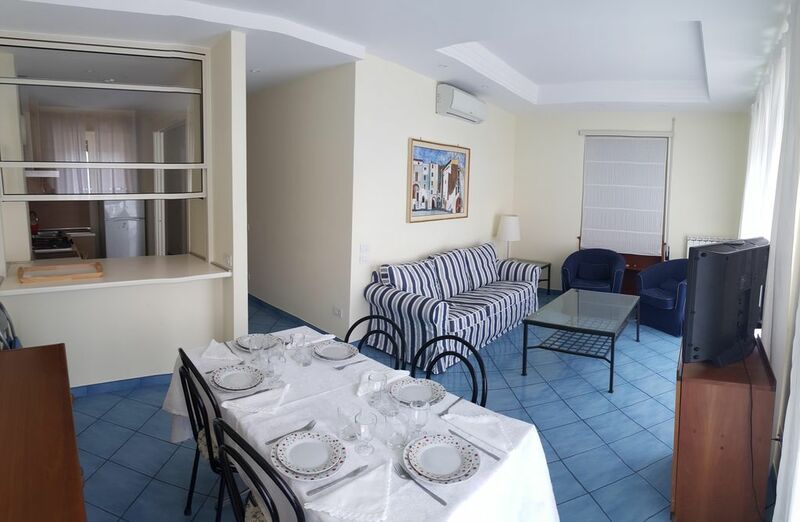 We are delighted that you enjoyed the apartment and in general your stay in Sperlonga. Thank you so much for choosing us in Sperlonga. We always look forward to a future stay. Thanks for everything and see you soon. L'appartamento è molto accogliente e ben curato in linea con la descrizione del sito. Daniel, Marco e la mamma sono stati molto gentili ed ospitali. Sperlonga si è poi rivelata una ottima meta per una vacanza di mare e relax. Lo consigliamo. Ciao Riccardo, siamo stati lietissimi di ospitare te e la tua famiglia a Sperlonga. Sono contentissimo che anche la nostra accoglienza è stata apprezzata, per noi è un onore! Grazie di tutto e vi aspettiamo sempre a Sperlonga. A presto. The apartment has a great view and was close to several restaurants. It had everything we needed for our stay. Thank you so much for the beautiful comment. We are happy that you have been well. We are always waiting for a next opportunity in Sperlonga. Beautiful clean and inviting Apartment with the perfect view! My wife and I in the most wonderful apartment in Sperlonga this past week. The apartment was magnificent. From the wonderful view of the ocean looking out the living room and dining room, the Bedrooms, kitchen and bathrooms. The entire apartment was remarkably clean. Access to the beach, just steps from the apartment was so convenient and easily accessible. The Police were very nice and so helpful when we needed assistance regarding parking our scooter. Sperlonga is a wonderful beach town where we enjoyed our holiday on the beautiful beaches that seem to run for miles and miles along the Italian coastline. Restaurants were plentiful with a wide range of menu items from pasta, steaks and seafood to choose from. My wife and I appreciated the kind hospitality the apartment owner provided us during our stay in their apartment in Sperlonga. We certainly recommend this apartment to all travelers looking for the perfect beach holiday! It is also the perfect place to stay if you are looking to go on day trips to see other towns. Gaeta, Fondi and Terracina are very close to Sperlonga and easily accessible by scooter or car. Perfect apartment overlooking the sea with the best location! We had a wonderful week! We will definitely go back! Hi Maria, we are delighted you had a wonderful week at the Seefront Sperlonga Apartment. We thank you for everything and we always look forward to Sperlonga. Everything was perfect. I even didn't expect the apartment would be so nice. Two bathrooms make it very convenient for the group of people like family. Terrace facing the beach is under the shadow of tents protecting leaving room from direct sunlight, we even didn’t turn on air conditioners during the stay. Beach is few minutes away from apartment, supermarket in 5 minutes and number of restaurants around. Another convenience was close bus stop where you can get a bus to go to Fondi train station or to Terracina. I recommend this apartment for renting. Thank you for everything Pavel. It was a pleasure to host you and your family. We always look forward to you for a next opportunity.